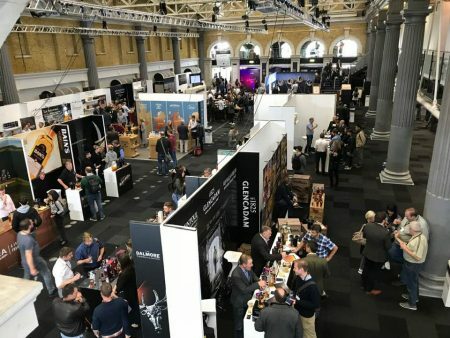 English whisky is experiencing something of a renaissance. A handful of distilleries now exist, from the established English Whisky Co. in Norfolk, to the new Lakes Distillery, up in Cumbria. 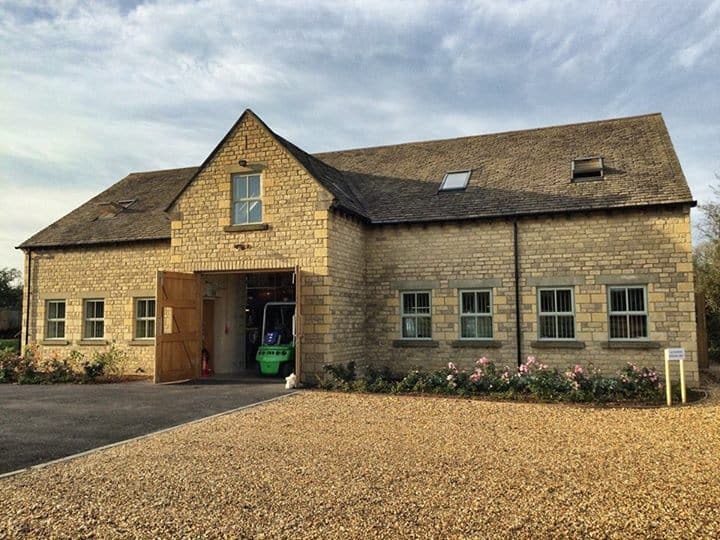 One of the new and rather impressive entries to the list is the Cotswolds Distillery. It’s set in rural Oxfordshire, on the outskirts of a picture-book village, where each of the houses is made from that peculiarly yellow local sandstone and all the gardens are maintained splendidly. On the day I visited there was a soft and milky autumnal light bathed across the setting. It was like stepping back fifty years, seeing an England that’s just like an old-fashioned postcard. Are those details important? Yes. Because the Cotswolds Distillery aims to capture that and bottle it. Like whisky pioneers Bruichladdich, the team here are concerned with terroir. 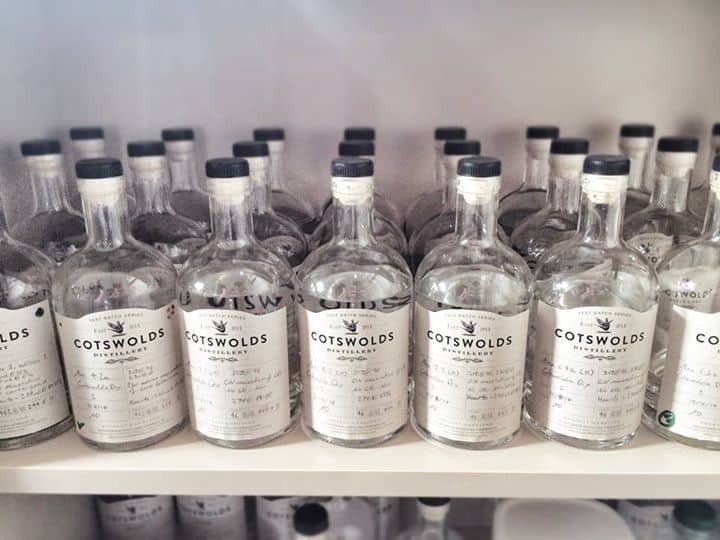 The Cotswolds Distillery currently produces whisky and gin, with an eye to making many more drinks to come, but both these starter spirits make full use of the local environment. Of the whisky: they’re looking to create a very local-style spirit at first – not merely a whisky that happens to be made in England (which has advantages I’ll mention later), but something that properly expresses the region. And the gin, too, is crafted using botanicals gleaned from the region. 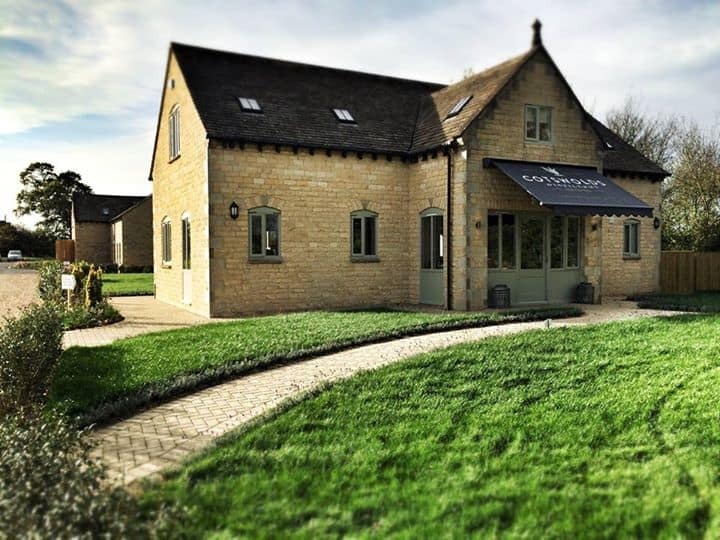 The Cotswolds Distillery is the brainchild of Daniel Szor, an American finance expert who made his money in the City. He moved to the Cotswolds with his wife, after falling in love with the place, and wanted to put his money to excellent use and build a distillery. Why not? He put a team together, drafted in expert advisers, and set about creating something rather lovely. There’s something very good about the fact that this is one man’s passion and money: there are no shareholders involved, this is no conglomerate, and the chances of a corporate buyout are very remote. Such a structure means that the distillery answers only to itself. I met-up with Head Distiller Alex Davies, formerly of Chase Distillery, who took me around the site. If a whisky distillery is in essence a factory then this has to be one of the most beautiful factories in the UK. It’s a small-scale, very local operation. The organic barley is taken from the nearby(ish) Warminster Maltings, Britain’s oldest working floor maltings, and mashed with Cotswolds water. Alex was clearly passionate about all kinds of drinks – from crafting gin, to being nifty with a cocktail – and that enthusiasm results in an air of experimentation. 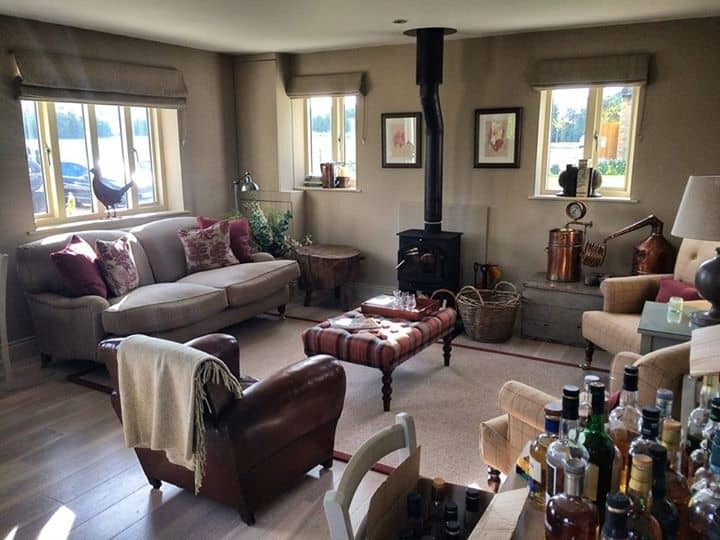 In this soft-lighted, attractive Cotswolds location, there is the promise of radical whisky. As you might have gathered, we’re talking about English whisky. Not Scotch. What’s the difference, you might ask? A huge rulebook of regulations is what’s different. Scotch whisky is the most regulated drink in the world – just in order to protect the sacred spirit from cheap knock-offs, and to provide some sort of heritage and consistency of style. However, because of such protections, it does somewhat restrict innovation (take the example of Compass Box’s Spice Tree blend). If you’re not making Scotch whisky then many of these regulations need not apply. 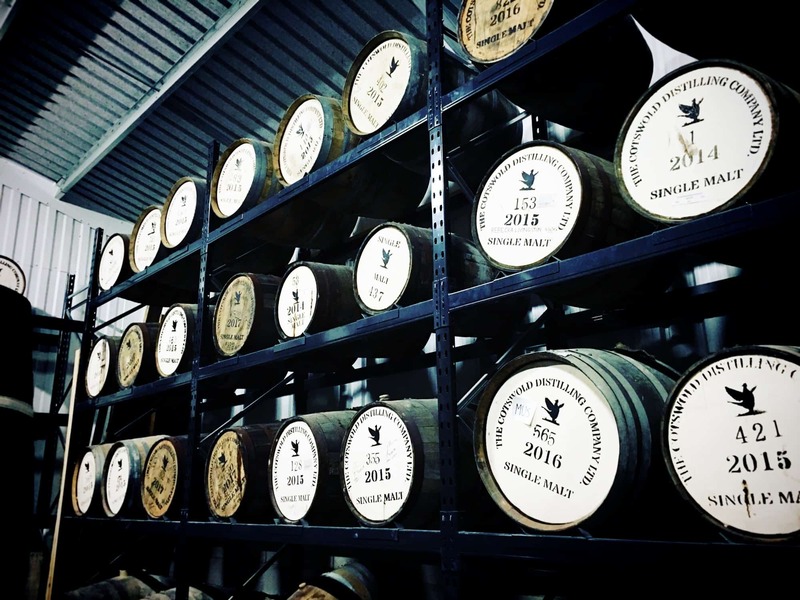 English whisky is bound only by EU regulations which – ironically given the number of regulations that this institution famously churns out – have a relatively light touch when it comes to whisky. You don’t have to use barley to make English whisky. 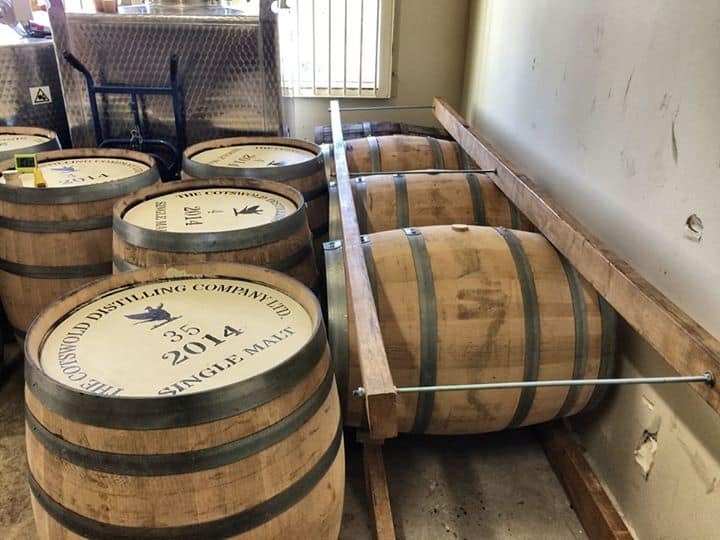 You don’t even have to use oak casks. If you’re making whisky in the Cotswolds you might even, as Alex said with an excited smile, be allowed to make rye whiskey, which is something that could never happen in Scotland. 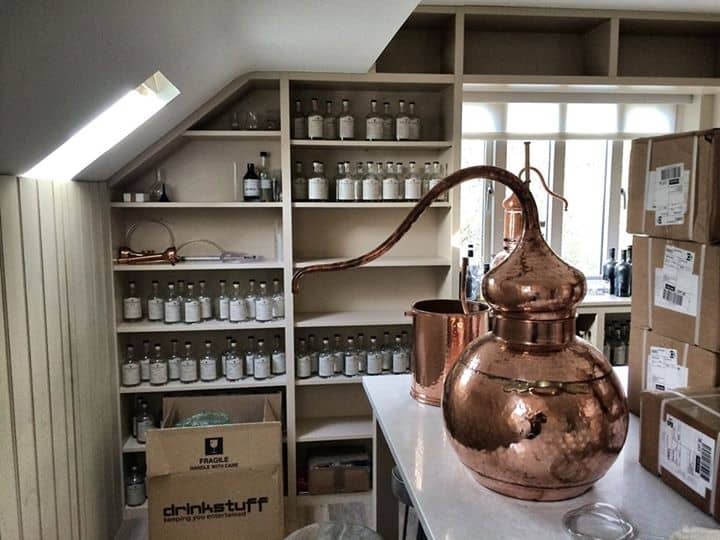 He’s figured it all out: if they were to do this at the Cotswolds Distillery, they’d use the still used for gin-making, so as not to affect the stills for the core malt whisky range. In the lab you can see more of this experimentation in action. Stills and bottles cover the walls like the domain of some modern-day alchemist. Here they make micro-scale herbal distillates, in order to build up their botanical library. The team are obsessed with aromas and tastes, and the dozens – possibly hundreds – of samples and bags of herbs lying about this room are a testament to the level of experimentation. A lot of this is to help produce the perfect combinations for gin and other spirits. (I noted a trophy-style certificate to the Gin Guild sitting on the windowsill, so they take all spirits seriously here.) But why restrict themselves to the lab? With a casual gesture to a hedgerow out the back, which was covered in autumn sloes and the last of summer’s haws, Alex casually suggested they were thinking about making a forager’s gin using fruits plucked from bushes in the nearby hedgerows. This is all to be admired. Experimentation, innovation – just giving things a go, that joie de vivre of whisky-making, is intoxicating for drinks nerds. It’s one of the reasons I fell in love with Bruichladdich many years ago, and – arguably – that attitude set so many trends that the rest of the industry followed, from branding to cask experimentation. 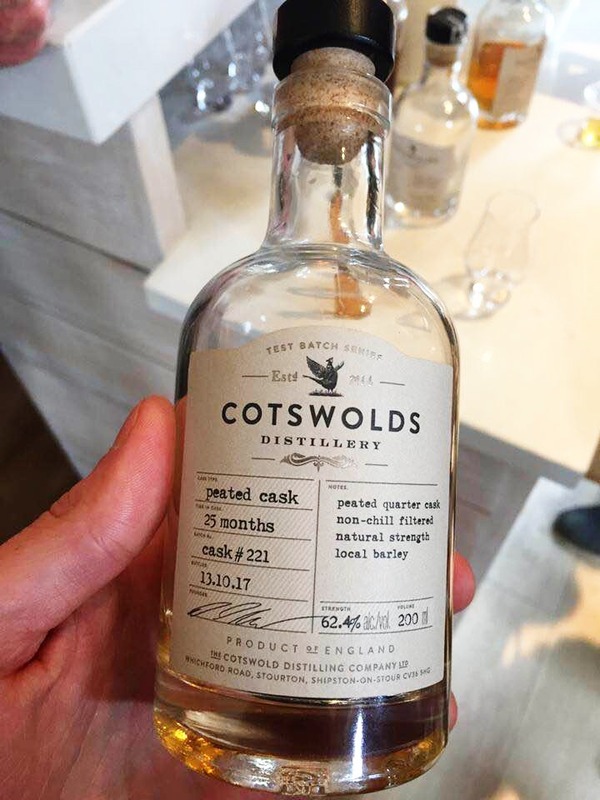 With that in mind, the Cotswolds Distillery is not just well worth a visit – if you are anywhere south of Birmingham, I insist you head there. 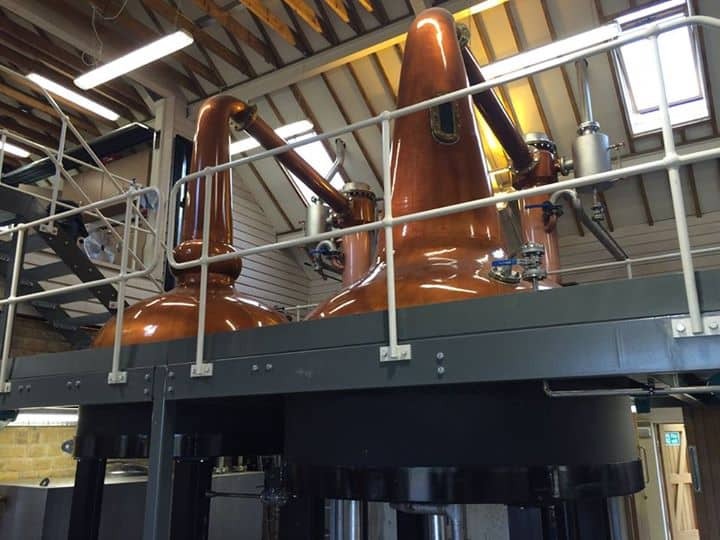 It looks like it is going to produce some genuinely fascinating drinks in future, and I can’t wait to get my hands on the first bottles of whisky.